DEMU train services are going to be introduced for the benefit of local passenger in the Dibrugarh – Tinsukia – Ledo/Dangri section w.e.f. 8th October, 16. 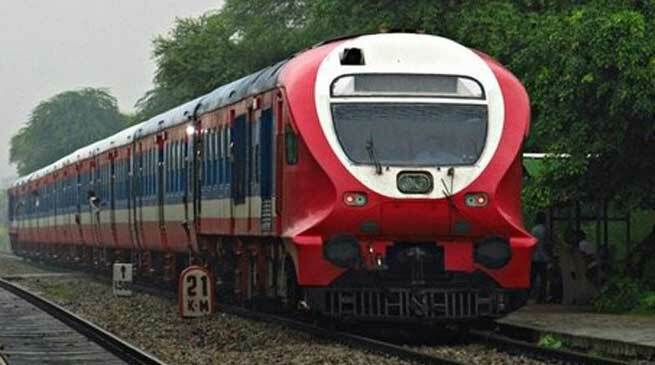 DEMU is special type of train which is very beneficial for transportation of local passenger which is being introduced for the first time in Assam and the whole of Northeast. DEMU stands for Diesel Electric Multiple Unit, which is a multiple-unit train powered by on-board diesel engines. A DEMU requires no separate engine or locomotive, as the engines are incorporated into one of the carriages. In a DEMU train, the primary fuel source is diesel. A diesel engine powers an alternator and subsequently feeds the electric motors. Here every passenger carrying coach has its own source of motive power fitted below the coach. This enables the DEMU train to have quick acceleration and retardation making them ideal to ply as shuttles between stations located at short intervals. Local passenger services are ideally suited to be of DEMU type for its inherent advantages. AS the DEMU train can ply in both directions, it does not require any cumbersome reversal at terminal stations. The coaches are also better adopted with more seating capacity. There will be total eight coaches in the DEMU train. Twelve DEMU trains will run daily in the Dibrugarh – Tinsukia – Ledo/Dangri section. DEMU train number 75901 will run between Tinsukia and Ledo. DEMU train number 75902 will run between Ledo and Tinsukia. DEMU train number 75903 will run between Dibrugarh Town and Tinsukia. DEMU train number 75904 will run between Tinsukia and Dibrugarh Town. DEMU train number 75905 will run between Dibrugarh Town and Ledo. DEMU train number 75906 will run between Ledo and Dibrugarh Town. DEMU train number 75907 will run between Dibrugarh Town and Ledo. DEMU train number 75908 will run between Ledo and Dibrugarh Town. DEMU train number 75909 will run between Dibrugarh Town and Dangri. DEMU train number 75910 will run between Dangri and Dibrugarh Town. DEMU train number 75911 will run between Tinsukia and Ledo. DEMU train number 75912 will run between Ledo and Tinsukia. Northeast Frontier Railway under the directive of Hon’ble Minister of State for Railways Rajen Gohain has been constantly endeavouring to cater to the need of railway passenger. Introduction of the DEMU trains is another step towards that direction.